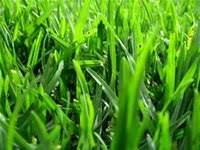 Menagerie Mind: Grass is Only Greener Elsewhere if You Compare Lawns! Grass is Only Greener Elsewhere if You Compare Lawns! Earlier this week I was talking to a colleague over a beer at Austin's High Tech Happy Hour about my new year's theme of happiness. He has the same "too many interests" thing that I have. We were talking about how nice it would be to be like people that have a singular focus. If we only had a sole purpose, just think what we might be able to accomplish! I can point to my boyfriend as an example. He's had a singular calling since the age of 5 when he starting drawing. He's an amazing artist and he's always been an artist. He eats, sleeps and breaths art and video games. He makes his living making art for video games. There is no question in his mind what he should be doing. He knows unequivocally that he is where he should be. He is happy. I envy the simplicity in that sort of existence. My colleague experienced similar comparisons with others. We both knew we brought value to the table because of our diversity, yet we still looked at those singular purpose folks with envy. After thinking about this though, it really is self-defeating behavior. Looking at others and comparing their existence, their happiness to mine only makes me feel less happy. How can anyone measure their own life against that of someone else? It's really silly if you think about it. There is always going to be someone that is (or at least appears to be) more than you: happier, smarter, richer, funnier, prettier, younger, etc. But does comparing yourself with that person in any way negate those attributes that you have? No. So why compare? Just so you can feel bad about yourself or have some false security in yourself? Looking externally for confirmation of your self worth is destructive. I do this ALL the time and looking at it this way it just feels negative and unnecessary. I think if I can manage to remove this "comparing grass" thought pattern from my daily life, I will be much closer to sustaining happiness. Note to self, tend my lawn, love my lawn, stop looking over the fence for reassurance!